In case you thought spirituality was only somber, reconsider. Observe Mother’s darshan programs, especially in the West, where smaller crowds allow time for Mother’s playfulness to surface even more than usual! The first night after the group’s arrival in Australia, Mother had great fun talking about the adventures of the tour group with the Customs people at the airport. Because of Australia’s fragile ecosystem, immigration authorities must be extremely strict and thorough. One of Mother’s son’s forgot to mention that he had three carrots in his kit – “Organic carrots,” he was saying later, in explanation: such precious things! He was held for questioning for three hours! Mother kept looking at him and laughing and saying, “Three carrots!” She pointed out that Lakshmi had declared a cake she was carrying for Mother, and they had let her through; perhaps people were meant to understand that cakes are better than carrots – even organic ones! One of the women in the group had not declared that she was bringing in “wood products”. It hadn’t occurred to her that the harmonium was of wood! Mother found that laughable, and there was a little discussion of keeping a harmonium in Australia for the future, to avoid complications at immigration. Sometimes She would be talking and laughing, teasing someone who wanted to become a brahmachari about how hard the life would be, or warning someone else about what foods are good to eat and what ones are not. “You sick?” She’d inquire, and then shake with laughter when a good number of hands would go up, admitting to stomach upset from all the rich foods. One night, just before the end of the tour, the girls traveling with Mother decided to perform a dance, which one of them, a classical Indian dancer had choreographed, to one of the newer bhajans. A space on the floor (where Mother could see) was cleared, the music started, and could you call them classical Indian rock stars? Mother risked falling out of Her chair, complete with some lucky person on Her lap, as She rolled from side to side, laughing and pointing. The boys in the tour group, not to be left out, put together their own dance performance for the next night. As is often done for classical Indian dance, they first demonstrated each movement, “translating” it, so that the uninitiated could understand the story. Then the music burst forth, they danced with exuberant energy, and Mother was again at risk of falling from Her chair! There were the babies whom She let play with Her nose ring, the two-year-old whose eyes would move unashamedly from Her Face to the tray of chocolates beside Her. To them She would offer a sweet – only to draw it back just as they reached, a game of laughter and frustration played just until it would have been too much for the youngster, and then She would relent, unwrap the sweet, and pop it into the open mouth. There were bigger children (say in their forties or fifties) who whispered to Mother that it was their birthday: She might stuff their ears with flower petals, shower petals over their heads, and make them bite into an apple of which She would then let go! They were reduced to grabbing it before it fell or else holding it with their teeth – such loss of dignity. Mother has said that when She hugs us, She is trying to awaken the “motherhood” dormant within us, that loving, compassionate, patient Inner Mother that She says we all need to bring more to the surface. Men and women alike, She says, need to develop this quality. So Mother’s darshan has a very serious purpose; isn’t it lovely that serious needn’t be attended by somber? April the 14th, 2001, marks the New Year in the Hindu calendar. 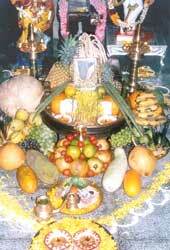 The focal point of the Vishu celebrations in Amritapuri was the Kalari, where Amma first started Krishna Bhava in 1975. The vishukkani (literally, ‘first sight of the year’) was kaleidoscopic display of elaborate floral arrangements and a platter of fruits. In Indian tradition, God is remembered at the outset of any new venture. This is especially true for the New Year. As such, it is believed that having a glimpse of auspicious items as the ‘first sight’ will usher in God’s blessings. At 4 a.m. the next day, the tiny veranda and garden in front of the Kalari was packed with devotees. Some sat in meditation, while others stood prayerfully awaiting their turn to visit the shrine. The atmosphere resounded with the sounds of the gong and the conch, announcing the moment of the ‘first sight’. The clamor lasted for as long as it took all who had gathered to offer their salutations to the beauty of the Lord’s creation. The symbolic significance behind this ritual resides in the prayerful desire to ensure that the bounteous blessings of God – represented by the harvest of fruits and flowers – be with us throughout the year. A mirror is strategically positioned between the fruits and flowers: as one beholds the auspicious vishukkani, one catches a glimpse of one’s own Self. Those familiar with Amritapuri may be surprised to learn that the old kitchen and “blue house” adjacent to the main temple building have been demolished. The much-beloved corner of our ashram will make way for a spanking new building housing a new dining hall, a spacious library and office rooms, among other facilities. Ram, the ashram’s darling elephant, has moved into his new quarters at the northwestern corner of the ashram. Every morning, he visits the Kalari, and every morning, goes for a walk around the ashram premises and sometimes, along the beach. During her Australian tours, Mother doesn’t usually go to Adelaide. It’s too far off Her “beaten track” in Australia. She visits Melbourne, on the south coast, then goes up to Sydney, Brisbane and Gold Coast. Four places, public programs in each, retreats in two-but nothing in Adelaide, further west on Australia’s southern coast. But the people in Mother’s satsang group there are people with big hearts, open smiles, eager hands, unflagging energy, and creative ideas. “We don’t have that much money,” said one of the devotees. “So we thought, what can we give?” They found plenty of answers, and one in particular caught Mother’s fancy when She recently heard about it during darshan one morning in Melbourne: The Car Wash.
Twice a month a good crew of Mother’s Adelaide children gathers to wash cars. The word is out around town, and each time there are both new customers and loyal returnees. “There are two ladies who always show up, competing to be first, sometimes they come half an hour before we’re ready to start!” To the car washers people bring their family cars, their BMW’s, or, in the case of one driver, his big (almost a sixteen-wheeler!) lorry! The customers like the service “We go all out-sometimes there are eight of us, all in our whites, waxing one car, for A$10,” explained one scrubber. “It’s so cheap and so good, people want to give us a tip,” said her companion. “And every car is washed with mantras!” And every cent, of course, builds up the Adelaide Satsang’s contribution to Mother’s works. All day on a Saturday, the satsang members are out there. They put up two tent-type gazebos (“White, of course,” laughed the man who was describing this); in this shade they set up tables for yet more ways to earn funds for Mother’s works: they sell the grapefruit marmalade one son makes, and the home made jams and fresh garden produce that others donate. There’s fruit juice to quench the thirst of customers while they wait there in the shade for their cars to be cleaned. Flyers about Amma and her charitable activities are available for those customers who ask, and of course group members are eager to talk about her if anyone shows interest. As if this twice-a-month project were not enough, the car washing idea expanded: why make people come to the public place when the work can be brought to them? There’s a retirement community that has a parking garage underground (this means, out of Adelaide’s heat!). Here, once a month, the car washers come with all their equipment and all their energy, and they pick up a list of cars to be washed. The owners don’t even need to be there. They will have left their keys, the volunteers will move the car into position, wash it, and re-park it, reversed, the sign that it’s been done. You might think the car washing project is enough. Adelaide’s satsang doesn’t agree. They are constantly on the lookout for other ways to raise funds for Mother’s work. The results are remarkable: one year, they raised A$17,000! The way they did this reflect their creativity and open-heartedness and their readiness to work hard! Here are some of the things they’re doing: They collect clothing, tools, books, anything anyone is ready to pass along and sell it to whoever comes to their garage sale. A local charity has a program, and Amma’s people rent space to set up tables for selling food; this way their rent money goes to a good cause, and the profit goes to Amma. An artist held an art show; the satsang sold tea to the patrons. There are designer quality clothes, barely used, offered to the group for reselling. The group is ready to sell whatever members want to make and donate: woollen shawls, art works, meditation stools (with Devi Bhava petals in the upholstered part of the seat), yoga mats (a member makes them in quantities that can be sold to a nearby yoga school). There are new ideas for items their creators hope might sell well: tiny Amma-doll brooches with Devi Bhava petals inside: “Keep Amma Close to Your Heart”; Amma’s Feet pillow cases; maybe an Amma hanky imprinted with “Let Amma Wipe Your Tears.” People who give massages offer their services and give the income to Mother. Group members catered and served a fancy, three-course Indian Dinner, seating a hundred people who dined by candle light. Another organization was holding a weekend retreat, and called upon the Adelaide Satsang to cater its meals. What strikes you when you talk with these people is their enthusiasm about Amma, about her mission, and about what they can do to help. As they kept saying, “We don’t have much money, so we look for what we can do.” They do an amazing variety of things, and at surprisingly low prices. Said one worker: “Amma wouldn’t want us to be greedy; it’s Her art, the art of really giving people something. So we go by Her principles…” No wonder Amma was so delighted while She was hugging these hardworking sevites from Australia’s southern coast. In Singapore every year the crowds are growing larger rapidly. These crowds are also becoming more diverse. (Once the domain of immigrants from India, Mother’s programs now draw people from all backgrounds, Hindu and Buddhist and Christian alike). This tendency to diversity underscores and is a response to the universality of Mother’s message, and the ability of Her loving embraces to reach across all barriers of background and culture. This was particularly evident during Devi Bhava, when people from all different backgrounds approached Amma, and asked Her for mantra initiation. Those of Hindu background tended to ask for mantras focused on Krishna, Devi, or Siva; Christians asked for mantras of Jesus Christ or Mother Mary; Buddhists wanted mantras of Kwan Yin, Tara and Buddha. All came to Amma to be initiated. They belied in Amma as being the One who could help them on their paths, irrespective of their beliefs and faiths. Everyone felt “at home”. The special meditation session with Mother had been held indoors because of both cold and rain. The last mantra, “Lokah samastah sukhino bhavantu” (“May all beings in the universe be happy”) was reverberating. Then silence. Not quite. Rain. Pitter-patter. Then faster. The lights came up; Mother looked ruefully around at the children. Then She looked up at the ceiling. She raised both Hands in that Indian gesture of “What to do?” and sat a little longer. Everyone listened to the rain, and envisioned the walk to the dining hall, where, traditionally, Mother would serve everyone dinner. A longish, wet walk. Mother asked whether dinner could be brought to the meditation hall. James, one of the organisers, gave a good disciple’s answer: “Yes, if Mother wants. We can bring it in ten minutes.” Mother asked the children: “Here? There?” The vote was mostly “There.” People didn’t mind getting wet; they would adjust. Mother seemed pleased, and told a traditional story. The special meditation session with Mother was ready to begin – outdoors, despite the gathering storm clouds. The beach hillock where Mother sat, surrounded by Her children, was almost dark, the only light coming from a few kerosene torches on high poles stuck into the sand. The first mantra, OM, was about to be chanted, but the anticipatory silence was broken by the sound of raindrops, a soft, muffled sound on sand, a bit sharper when drops hit the sound system’s speakers and the hastily opened umbrellas. Mother looked around at Her children: “How many children umbrellas?” She asked. Maybe several could huddle under each umbrella, and all would stay dry. But only a few hands were raised. Mother waved away the umbrella someone held above Her, and joined Her children in getting wet. People gave up their ponchos and umbrellas to shield cameras and speakers. The rain came harder. “There? Here?” Mother asked, willing to take the group back in to the program hall. “Here!” came the vote. Mother seemed pleased, and told the same traditional story. Mother told Her children, on those two rainy nights, that instead of always trying to change the outside circumstances, it is often good to try to adjust to what is, or to make changes in ourselves. The retreatants were ready to get wet; they faced the situation with cheerful acceptance. In Melbourne, as they left the meditation hall for the dining hall, the rain let up; in Gold Coast, after just enough rain to make the willing people cool, it tapered off. Mere chance? Or is there a message in these facts, too? On the 1st program, held in Nazrul Manch on the 2nd of April, the huge auditorium was filled with thousands of devotees who had gathered to hear Amma’s satsang and bhajans and to have Her darshan. The next night, in Behala, Golsapur, Amma was accorded a hearty welcome by a mammoth gathering of devotees on Her arrival at the programme venue in Behala, Calcutta.